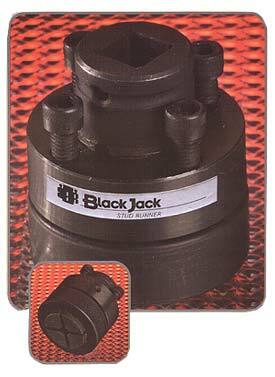 The BlackJack® Stud Runner or stud extractor is a versatile tool designed for the removal or insertion of threaded studs into blind stud holes. Stud runners are made for stud diameters from 1/2" to 7" with any thread pitch available. 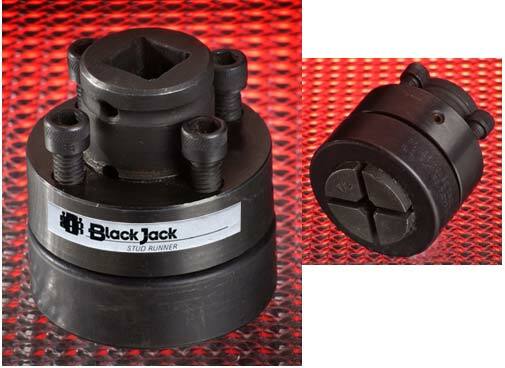 Clamping force on the end of the stud is generated by a closing collet designed to grip the minor diameter of the thread without inflicting damage on the thread root. A knurled collet is used for superior clamping on the stud when replacement studs will be utilized. The principal operation entails threading the collet on to the stud until it is bottomed out. A multi-jack bolt tensioner is tightened with an allen key forcing the tapered ring down over the collet. The taper produces an internal radial clamping force that compresses the collet onto the stud. The Stud Runner grips so tightly that a tremendous amount of torque can be applied in either direction. The collet design provides a 1/2"; 3/4"; 1"; 1-1/2" or 2-1/2" female square drive for use with standard tooling, such as impact wrenches, hydraulic torque wrenches or breaker bars when removing or installing a stud. 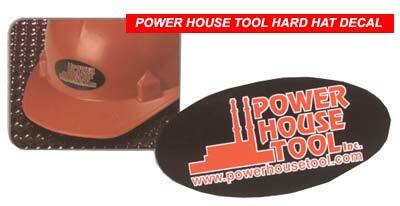 on our products and to get our decals.